Ochs encloses copies of replies to his solicitation letters. 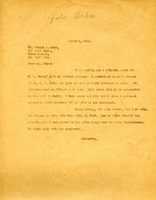 Berry encloses a clipping about B.N. 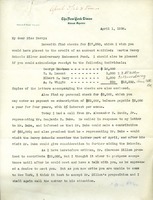 Duke's gift to Wofford College, suggesting that he might give more generously to Berry than he has in the past. She also suggests contacting Henry McHarg. Ochs encloses contributions to the Martha Berry Schools Silver Anniversary Endowment Fund, asking that Berry send acknowledgements to the donors. He also encloses his own check, in partial payment of his $25,000 subscription. Ochs reports on other commitments and solicitations, commenting that it is a source of embarrassment to him that some donors are giving as a personal favor to him. 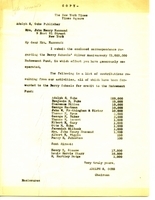 There is also some embarrassment caused by Berry's decision not to solicit those who have previously been benefactors.